Iowa City New University Conference NUC is an organization of political men and women. We are open to all persons willing to work in, around or in spite of the University of Iowa. Our primary constituency is faculty and graduate students. But we welcome undergraduates, university staff members, and local residents. While our goals are not specifically educationist, we do have a central concern with people in the university and in Iowa City, and with the political implications of our jobs and our life as students and teachers. NUC is committed to political struggle for a new, American form of socialism. While we are not a doctrinaire group, we are committed in our opposition to the American State. Our goal is to replace its systems of class, sexual, and racial oppression with a society based on the principles of equality and freedom. We are together in a national organization because we do not believe that radical change will come about by people doing their own thing. Membership in NUC means a commitment to politically disciplined work, participation in serious self-education through the chapter's program in internal education, and a willingness to engage in collective discussion of one's own political work. 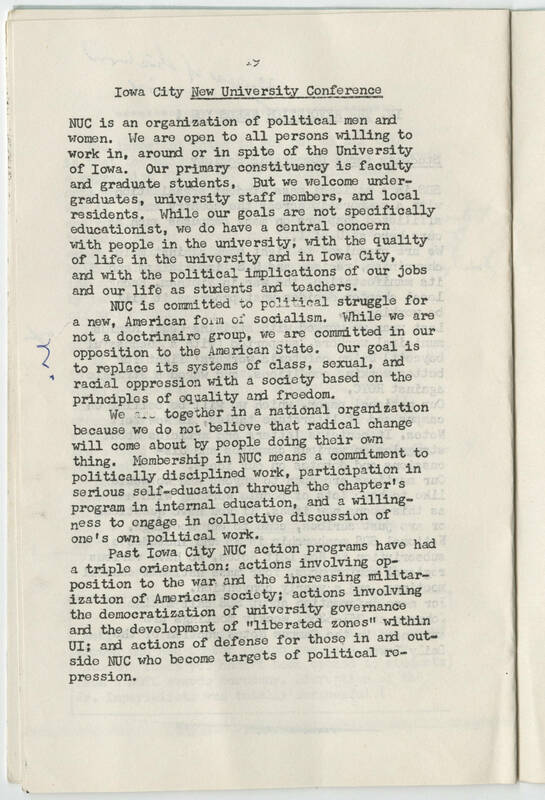 Past Iowa City NUC action programs have had a triple orientation: actions involving opposition to the war and the increasing militarization of American society ; actions involving the democratization of university governance and the development of "liberated zones" within UI; and actions of defense for those in and outside NUC who become targets of political repression.